Batty and I have a new tradition. I go on vacation, he gets an abscess. He was a little wonky at our lesson before vacation. Not lame so much as a little ouchy up front. We pushed through it as he was find unless we got into the really deep sand and we both survived. We even survived a hay bale jump that he thought was going to eat him alive. But, we got over it and connected 3 big boy jumps together and called it a night. Not thinking much of it, I gave him some bute for a couple of days, he seemed 100%, and I went on vacation. I had some fleeting thoughts about soaking his front feet with white lightning before vacation, just in case (brain kept hinting at abscess), but honestly? I ran out of time. Between the heat, buying grain before vacation, and picking up our once dead, now fixed lawn mower (and successfully backing trailer DOWN my long driveway), I just didn’t have time. As it was, I don’t know how I got what I got done. So, no front hoof soaking. Which turned out OK because the abscess turned out to be in him right hind hoof (and he just showed generally ouchiness upfront). Horse sitter let me know Saturday morning that he started gimping a few days before and was walking on his toe and gimping around starting Friday. Considering he was 3-legged lame last summer when she watched him, she wasn’t super concerned and didn’t want to take away from my vacation this time. All was fine, but damn, 9 months without an abscess and I go on vacation and? Abscess. So we got home on Saturday night and I didn’t deal with his hoof until Sunday. He was miserable, 3-legged, and stocked up in his right hind. Our typical reaction. 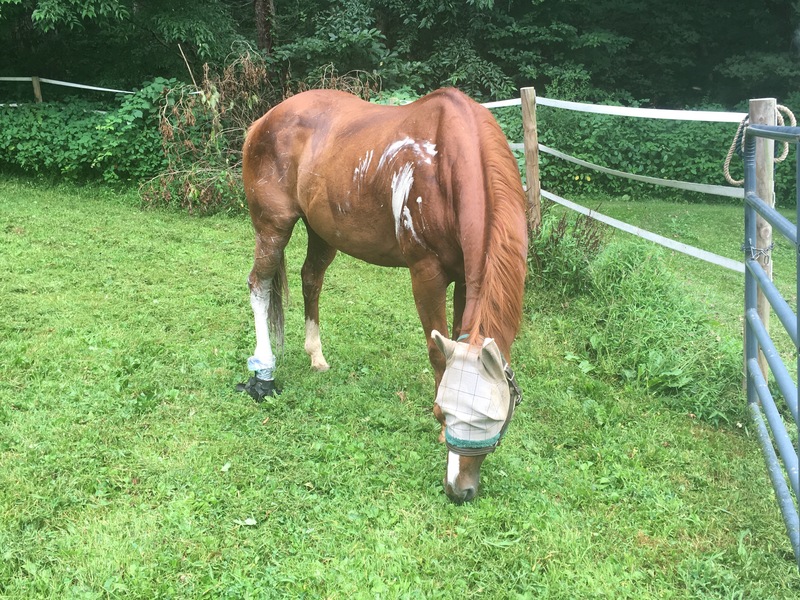 But, he had no issues gimping to the water, his bucket, and the hay so… Anyway, I did a white lightning soak Sunday and poulticed his leg. Hoof was definitely bothering him and he did NOT want the hoof wrap on (just while his foot was in the white lightning bag), but we survived. Popped a 2″ hole out his coronet. And I’m pretty sure it still hurts. So much so that he tried to kick me when I set to soak with white lightning (had to get husband to help since this idiot wanted NOTHING to do with me messing with his hoof. Then he decided to run away from me (he’s sound at the trot). Needless to say, I was NOT happy with him and I have a bruised thumb thanks to his antics. Anyway, I got my husband to help with a chain and got his soak going and leg poulticed (don’t mind the excess poultice hand prints…) and dumped him him the round pen (that still needs tree limb repairs) and left him for an hour. After ignoring each other for an hour (the 98* weather didn’t help any of this), we were both in better moods. Removed the wrap without issue. In fact, he even let me squirt iodine in his gaping hoof hole with no issues and didn’t fight the ichthammol either. While he sound, I’m pretty sure there’s more to draw out. 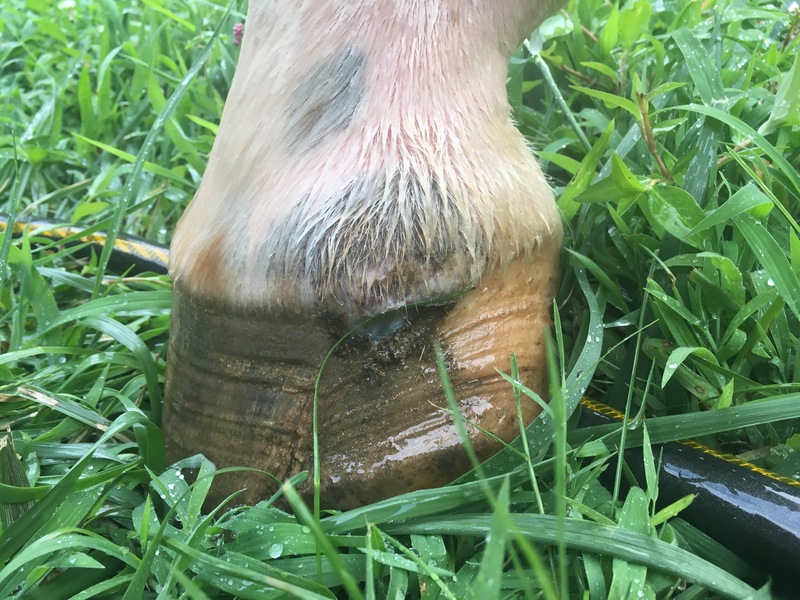 That said, why, of all hooves, do we need an abscess in his already crappy, scar tissue filled hoof? And to blow out the coronary band? So that it can grow down where he’s got plenty of scar tissue and a permanent crack and structural instability? This entry was tagged abscesses, Batts, white lightning. Bookmark the permalink.